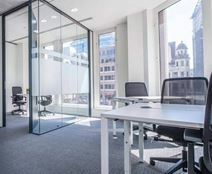 Situated on the 14th floor of an international Grade A tower block in the heart of the Shenyang North Railway Central Business District, this centre offers private and coworking options to members on a flexible basis. The space is situated in a mixed-use complex, filled with high-end office space, first class restaurants and a multitude of retail shopping options, all of this without stepping foot outside the building. Just a five-minute walk to Shenyang North Railway Station, this centre provides a variety of solutions to suit a variety of budgets and working styles from the 17th floor of a modern Grade-A office tower.